Amazing 2018 fall season for the Warwick Valley Girls Varsity Tennis Team: Warwick’s Wild Card and # 1 Doubles Team qualify for States! The fall tryouts started early this year: Aug. 13, 2018. The Junior Varsity and Varsity Tennis teams held their tryouts accordingly, and the teams were formed. JV kept 23 athletes, and Varsity had 20 girls, including 14 seniors. Playing for Varsity as Singles were Sammy Killin #1, Gabby Donohue #2, Alexandra Krasinska #3, and Amelia Pizza #4. 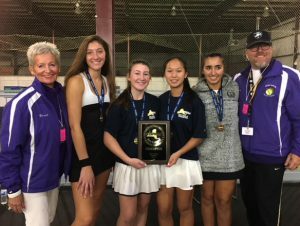 The Doubles Teams were Ava Ghobadian and Stephanie Menoutis (#1); Ashley Emanuel and Jacqueline Smith (#2), and Lexi Cleary and Rita Spain (#3). The Exhibition part of the team was: Nadia Fayed, Danielle Goldbaum, Rachel Goldbaum, Maria Klysko, Natalie Parashiv, Miko Cianfracco, Alyse Frantzen, Briana Lawrence, Jessie Schaechinger, and Mack Baird. Throughout the season the girls dealt with the incredible heat index and rainouts. They played hard for the team, and for the third consecutive year won the Division 2 Title of the OCIAA League! They had a terrific record of 12-2! 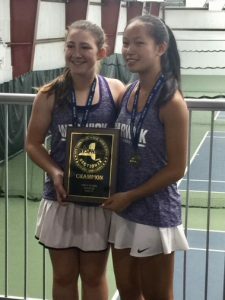 The Division 2 Title was captured at Cornwall, by 4th Singles player Amelia Pizza in a 2.5 hour match against Cornwall’s Jessica Wu. Amelia knew it was an important match – it was League – and that was all she needed to know. Amelia was determined to beat her Cornwall opponent, losing to her just two weeks prior. Clinching the Division also meant that many of the girls qualified for the OCIAA Tournament, held Oct. 10-12 at Match Point Tennis, Goshen. Sammy Killin and Gabby Donohue were going as the Warwick Wild Card. Both qualified as Singles, but decided with Coach Filingeri that they would have a terrific chance of progressing to Sections and States, as they played prior to this season as the #2 Doubles Team for two years. 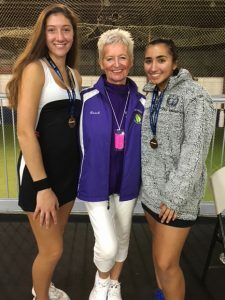 Alexandra Krasinska qualified as a Singles player, as did the Doubles teams of Ava Ghobadian and Stephanie Menoutis (14-0 for the season), and Ashley Emanuel and Jacqueline Smith (9-5). The OCIAA Tournament was fantastic! On the first day of the tournament Killin/Donohue and Ghobadian/Menoutis qualified for the Section 9 Tournament and made it to the semi-finals. Defeating NFA and Washingtonville respectively, on Oct. 12, the final match was set: two Warwick teams! Killin/Donohue prevailed throughout the match against their teammates, winning the finals (6- 0, 6-4). In the consolation round, Washingtonville outlasted NFA (6-2, 6-3). All four teams were onto the Section 9 Tournament the following week, however, it was a double-header for Warwick, and it was a glorious win! The Section 9 Tournament was held Oct. 18-19 at Match Point. Here two Section 9 leagues, OCIAA and MHAL, meet for the first time, vying for the State Championships, where only the top three of both Singles and Doubles qualify. Warwick’s Killn/Donohue were seeded #1, as the winners of the OCIAA; Jaros/DelSalto of Marlboro were seeded #2, as the winners of MHAL; Ghobadian/Menoutis, Warwick’s second team, were #3; and Ma/Li of Spackenkill were #4. Ghobadian/Menoutis were the only pure Doubles Team in the top four, as the other teams were all Wild Cards (singles players.) From the round of 16 the top four Seeds progressed to the second day of play and to the semi-final round. At this time, match play has regular scoring, and no sudden death, as is played throughout the season. Two years ago, and last year, Sammy Killin and Gabby Donohue lost in the quarter finals and the semi-finals round to their teammates. They were determined, worked and trained hard, and hardly faltered in their quest for the Section 9 Title. Making it into the semi-final round they lost only one game. In the semi-final they played the #4 Seed, beating them, (6-0, 7-5). On the other court, Ghobadian/Menoutis put it all out there! Playing their game, and playing “smarter, not harder,” unless the moment was right, they sailed to victory (6-3, 6-3), coming in third, and able to join their teammates at States! A first time ever for Warwick! What an amazing season! Division 2 champs! County champs! And Section 9 champs! All four athletes attained their original goals set at the beginning of the season! Teammates were very supportive and helped in the girls’ progress and win, as did Coaches Filingeri and Zwart and their extremely supportive families! There is no “I” in team, and the Warwick Varsity Girls Tennis Team is truly that and more: It is a family!